How Do You Know It’s Energy Efficient? The good news is that the energy efficiency of a home or building is measurable in a variety of ways based on the science that a house with leaks or holes of any kind is harder to heat or cool due to air exchange or loss. This might sound too simple because most people probably don’t even think that their home has air leaks unless there’s an obvious draft around a window or door. But the air leaks or holes that are most often the culprit for energy loss occur around the less obvious areas such as basement rim joist areas, fireplace surrounds, holes cut by plumbers for bathtub or shower traps and/or plumbing vent pipes, utility chases, soffits, cracks between finish flooring and baseboards, and recessed can lights. So, while it’s not realistic to construct a home or building that has no air leakage, an often-heard concept or term that is associated with energy efficiency construction is ‘airtight’ – meaning the degree to which the leaks are minimized throughout the building envelope. One testing method that we routinely use during the construction process is a mechanical blower- door test which measures how airtight the home is, the airflow between building spaces, and specifically, the location of any leaks in the building enclosure or ductworks. One of the outcomes of this testing is a HERS score of the home. A HERS score is the industry gold standard by which a home’s energy efficiency is measured. The lower the score- the better the energy efficiency and savings. A new home built to the State’s building code has a baseline score of 100. A typical re-sale home on the market would have a score of 130-150 or those that are older, poorly built or in poor condition would have a much higher score. 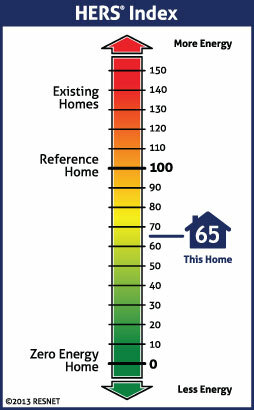 A home with a HERS score of 55 is 45% more energy efficient than a new home built to current building code requirements. A home with a HERS score of 150 is 50% less energy efficient than a new home built to current building code requirements. As builders who began testing our homes for airtightness as far back as 2002, we are glad to see that testing to verify energy performance will become standard practice throughout Connecticut thanks to the latest 2014 building code which requires every builder to conduct blower-door and duct testing of newly built homes. The way we see it, the adoption of the blower-door test requirement means that all prospective homeowners in Connecticut will now know how energy efficient a new home is relative to the standard benchmark. This statistic will indicate the future costs to heat/cool and power the home, thus enabling prospective homeowners to calculate the long-term costs of maintaining one home versus another. The amount of savings realized in an energy-efficient home as contrasted to a home built to code minimums will be immediately evident. We believe this new information will not only fundamentally revolutionize the decision-making process in buying and building new homes, but we are equally confident it will have an impact on the resale value of homes in Connecticut as energy-efficiency ratings become a vital component in home purchasing decisions. According to a recent study conducted in California, out of 1.6 million homes sold for resale between 2007-2012, sellers were paid, on average, 9% more when the home was certified as energy efficient.